We’d love your help. Let us know what’s wrong with this preview of Tree of Dreams by Laura Resau. To ask other readers questions about Tree of Dreams, please sign up. Great book! Chocolate, the rain forest, environmental activism, and accessible for adults + kids! What's not to love? I feel like when most people hear about oil drilling destroying rain forests, they think, that's too bad. They feel sad for a few minutes--at most. And then they move on. This book made it personal. Tree of Dreams is a high quality novel unlike any other I've read--and as of now, I've read 661 books. It is a book about forgiveness, and courage, and standing up for what's right. It's a novel that made me step outside my comfort zone, and confront what a catastrophe it is tha This book blew my mind. Tree of Dreams is a high quality novel unlike any other I've read--and as of now, I've read 661 books. It is a book about forgiveness, and courage, and standing up for what's right. It's a novel that made me step outside my comfort zone, and confront what a catastrophe it is that our rain forests are being razed. More than that, Tree of Dreams served as a reminder that everyone can make a difference. Even if it seems small, together we can work miracles. 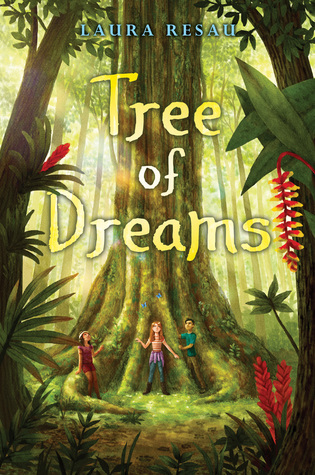 And not only does Tree of Dreams have incredible social value, but it is also a fun book. I read it in a day, and there were times I laughed out loud, and others where I teared up. The characters are developed and leap off the page, and Coco is a relatable main character with both virtues and flaws. The plot is gripping and the pacing is perfect, and the writing is gorgeous. It's a true masterpiece. Tree of Dreams, by Laura Resau, is a middle-grade novel that will satisfy your stomach, mind and heart. The story of Coco, a 7th-grader living in the Colorado mountain town of Heartbeat Springs; it is a tale of fierce love, mouth-watering chocolate, changing friendships, magical dreams, and ultimately - forgiveness. It also shines a light on environmental issues in the Amazon rainforests, including the dangerous effects of deforestation, oil exploration and drilling. Coco and her mother run a ch Tree of Dreams, by Laura Resau, is a middle-grade novel that will satisfy your stomach, mind and heart. The story of Coco, a 7th-grader living in the Colorado mountain town of Heartbeat Springs; it is a tale of fierce love, mouth-watering chocolate, changing friendships, magical dreams, and ultimately - forgiveness. It also shines a light on environmental issues in the Amazon rainforests, including the dangerous effects of deforestation, oil exploration and drilling. Coco and her mother run a chocolate shop in Heartbeat Springs, and the detailed descriptions of the chocolate making process are fascinating and poetic. They will also have you longing for a heart-shaped sample from the shop, El Corazon. But Coco's mother's bills are piling up, and unless Coco can find a way to make money fast, El Corazon is in danger of closing its doors. At night, Coco begins to dream of a tree, one that speaks to her, telling her it has a treasure within. Convinced that her dream tree will help solve their financial troubles and help her save El Corazon, Coco enters a contest to win a trip to the place where she believes her dream tree is - the Amazon rainforest. What follows is an unexpected outcome, followed by a trip to the rainforests of Ecaudor with Leo, the boy who, up until the 7th grade, was Coco's best friend. Coco soon finds herself aboard a tiny plane with her Mom, Leo, and Leo's Mom - and then in the heart of the jungle, next to the paws of panthers and bunking at a Co-op with the Huarani, the indigenous people who live there. She's looking for her dream tree, a ceiba - but suspects that Leo is looking for it too. But she wants to make sure that she gets to it, and its treasure first, and soon makes a rash decision that will change her life - and the lives of her new friends, the Huarani - forever. A story that will inspire the dreamer in every reader, Tree of Dreams is bright with hope and alive with magic. It is also a tale that reminds us how important cultivating and caring for friendships is, because the friends we love are also part of our family. Coco's family expands as her heart does, taking in a whole rainforest of trees, creatures, and the Huarani people. This is a novel to put in the hands of students readers and hope that they, too, will feel the beating hearts of the trees and people of the Amazon, and want to help similarly devastated communities and join in environmental conservation efforts in the future. They'll also want to grab a healthy dose of chocolate to enjoy by the book's delicious and heartwarming end. Thanks to the @kidlitexchange network and the publisher for the review copy of this book – all opinions are my own. 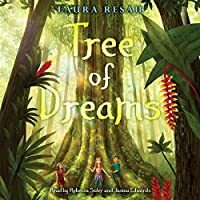 Tree of Dreams by Laura Resau (set to release March 26, 2019) is a deliciously sweet middle grades novel about friendship, forgiveness, doing the right thing, environmental conservation, and chocolate. Coco, a 7th grader, helps her mother run their chocolate shop, El Corazón. They’re a small bean to bar factory located in a tiny resort town called Heartbeat Springs in Colorado. A n Thanks to the @kidlitexchange network and the publisher for the review copy of this book – all opinions are my own. Tree of Dreams by Laura Resau (set to release March 26, 2019) is a deliciously sweet middle grades novel about friendship, forgiveness, doing the right thing, environmental conservation, and chocolate. Coco, a 7th grader, helps her mother run their chocolate shop, El Corazón. They’re a small bean to bar factory located in a tiny resort town called Heartbeat Springs in Colorado. A new donut shop has opened up across the street and business is dwindling for El Corazón. Coco’s mom announces that they may have to close the shop and it begins to rip at Coco’s already damaged heart. Her heart is already partially damaged because her best friend since birth, Leo, started ignoring her at the start of the school year. Coco beings having mysterious dreams about a cieba tree. In the dreams, the tree seems to be beckoning her to find it and the treasure that lies beneath its roots. Coco is hopeful that this treasure will be what saves El Corazón. Coco and Leo both end up entering and winning a dessert competition that allows them to travel to the Amazon. While in the Amazon, they mend their friendship while searching for the cieba tree. During their quest, they come face-to-face with the deforestation, death, and disease that is occurring in the rainforest due to oil drilling, and they vow to do something to stop it. This was a beautifully written middle grade novel. The book is full of amazing and detailed imagery and figurative language. The characters are so sweet and relatable. Coco and Leo are both going through normal middle school issues of peer pressure and changing friendships which readers can totally relate to. I love how Resau included chapters from the perspective of the cieba tree. In these chapters, wisdom is doled out and the reader is able to see how everything is connected. I feel that that is larger message of this novel; in some, we are all connected to everything (to each other, to plants, animals, etc.) and we are responsible for each other. I think that this is a very timely novel as well since our environment is rapidly changing due to so many factors (including deforestation). This novel introduces younger readers to deforestation and pollution and the effects it has on the environment and animals, plants, and humans who live in the area. I truly enjoyed this book and hope to share it with my students when it’s released. I feel that students who enjoy books about environmental issues (like Hoot or Flush), friendship, and adventure like this book. This was such an unexpected jewel! I chose it on a whim and didn't expect much and was greatly surprised with how wonderful it was. My five year old son has been listening to the story and is now fired up to help protect the rainforests. The way the Grandmother tree was portrayed was beautiful. I really love the beautiful way the author described the interconnectedness of all living things. Can I just say how much I love this book? I love this book. Chocolate, friendship, rainforests, family--and taking care of it all while having adventures galore. Adult readers as well as the kiddos will find this book delish. No joke. One of my favorite reads of late. Did not meet the needs of my collection at this time. Young chocolatier Coco’s four chambered heart loves four things: her mom, her former best friend Leo, her grandfatherly friend Gali, and her chocolate shop, El Corazón. It’s getting difficult to compete with the new, cheap donut shop across the street, and Coco’s mom has to start thinking about closing their beloved shop. Coco begins having vivid dreams of a wise ceiba tree, telling her about a treasure that is hidden within its’ roots. If she can win a dessert making contest, the grand prize is a trip to the Amazonian rainforest. Could her dreams (and her chocolate) lead her to the tree and to treasure? To salvation for El Corazón? And what about her friendship with Leo? Can that be salvaged too? Coco comes face to face with destruction-of her own heart, and of the rainforest. She learns how humans and machines are destroying carefully balanced ecosystems. She learns how to heal a poisoned heart, a broken friendship, and a struggling community. @lauraresau’s lovely novel, published by @scholasticinc would fit well in 4th-7th grade classrooms, especially those studying ecology or Rainforest biomes. Look for it on March 26, 2019. Swipe to see the gorgeous inside of this novel. Chapters narrated by the ceiba tree are printed white-on-black, giving an ethereal quality to Coco’s dream tree. What a great MG read. Well researched and touching. Award-winning author Laura Resau takes readers once again on an adventure to Latin America – this time to the jungle of the Amazon River in Ecuador. Coco and her mother own a chocolate store in Colorado which is failing miserably. Unless things pick up, they will go out of business. Both she and former best friend/now rival Leo win a mysterious contest that takes them to the heart of cacao country where they seek the treasure that the ceiba tree has sent to them in their dreams. Not really magic Award-winning author Laura Resau takes readers once again on an adventure to Latin America – this time to the jungle of the Amazon River in Ecuador. Not really magical realism, although the tree does “talk” in occasional chapters and seems to “project” thoughts of the treasure, this adventure story is full of detail about the Amazon jungle and life in a chocolate factory in grand detail. Cryptic comments and flowery language work side by side to bolster up the story. Descriptions of the animals and plant life in the jungle were the best part of this book. I felt the character of Coco was a bit hard and bitter, making her a challenge at times to really like. Other characters really faded into te background. Additionally, Coco’s detailed description of the chocolate making process including mention of being able to tell which contestants had used the chocolate she and her mother manufactured and the effects of chocolate on serotonin levels, etc. a bit hard to swallow, given that she is a seventh grader. She often used the same kind of language that adults use to describe fine wines and differing coffees, sounding much too mature for her 13-14 years. Maybe that was the author’s point (that she was indeed an expert on the topic), but I felt it a turn-off for me. BTW, the best-known of the ceiba trees are the kapok. While Kirkus gave this one star, I gave it only four and rate it recommended. Gorgeous and totally unique! Friendship, bravery, and embracing change are themes in this novel, but it is incredibly different than other middle grade novels because of the cultural and environmental focus. I also long to taste the delicious treats mentioned, and a trip to the rain forest may be in my near future! Gorgeous story.